CERN | D-Wave | AI | Neural Lace | Transhumanism - The Matrix Has Become Reality | The Mark is Here | Take The RedPill! Imagine you just woke up and the NWO agenda had begun while you were sleeping. You go to make some coffee as you ponder why your alarm clock failed to wake you on time only to discover that you have no electricity. As you peer through your curtains, you can see soldiers on the streets herding people into vehicles and then you hear the bull horn announcement echoing through the neighborhood telling you to “shelter in place” until the authorities come to your house to “process” you and your family. OK so it has been a while since my last article post, and that is because I ran into some new research and it took quite a bit of my time to study and process it. There is so much to talk about in this article that I literally spent hours (whole 8 hour days) going over it all because there is just so much to cover. I have been taking all this in just over the last six weeks and my brain was getting fried from it. I had trouble sleeping because my mind was just in constant process mode. OK so here is the culmination of my latest research and I will try to give it to you in the most easy to understand terms I can. Pay attention though, this is largely above graduate level science we are going to cover. I guess we can start off with CERN. I recently discovered that CERN intends to take heavy lead ion particles and accelerate them to 99.999% the speed of light (186,000 Miles Per Second – MPS) in the LHC and then feed them directly into a “Wakefield accelerator”; now the differences between the two accelerators are as such, the LHC is a synchrotron particle accelerator and the Wakefield Accelerator is a linear particle accelerator. If you are not familiar with the Wakefield Accelerator, you can read about it here (Plasma Wakefield Acceleration). I won’t go into the science of the LHC here as there is plenty of that to go around as it is and you can do your own research on that easy enough. According to Anthony Patch, both particle accelerators are to be joined, with protons pre-accelerated from within the Main Ring of the LHC and only one of the two, contra-rotating beams containing protons will feed into the AWAKE linear accelerator. This matches with what is stated on the AWAKE project page that gives details of the experiment layout “These protons will be injected into a 10-metre plasma cell to initiate strong wakefields. A second beam – the “witness” electron beam – would then be accelerated by the wakefields, gaining up to several gigavolts of energy. Assuming approval of AWAKE in mid 2013, the first proton beams could be sent to the plasma cell at the end of 2016“. I have also been told, by another source who is under the impression that there is currently no plan to combine the LHC and the Wakefield accelerator, that the first test of the AWAKE project is supposed to only be a feasibility test used to create a baseline assessment of the pre-acceleration test using the Super Proton Synchrotron (SPS) to pre-accelerate the particles into the Wakefield accelerator. That source states that the SPS is a pre-accelerator for the CERN LHC. The verification I have found for the use of the SPS can be seen here. This is from CERN’s own document server so I have to assume this to be correct accordingly. In a nutshell, the Wakefield accelerator will greatly increase the mass of the protons, the power of the Wakefield accelerator is about thousand times that of the LHC, which will most likely create an extremely powerful reaction as the matter passes through the Wakefield Accelerator. the Southern Pole of Saturn. In conjunction with this targeting of the North Area, a toroidal field will be produced by the LHC. The toroidal field will then create a torsion field above it. Streaming out of these combined fields are the Birkeland currents”. Mr. Patch has further indicated “the North Area also is where 20 PeV (Peta electron Volts) will be focused upon Strangelets, a quark-gluon condensate. It is the breaking of the ‘strong force’, as nuclear force known as gluons binding quarks that must be overcome by this level of concentrated energy. Upon breaking at the quantum scale, the portal opens”. similar to that of energy escaping from the top and bottom of black holes. You can watch the 3 part series produced by David LaPoint titled “The Primer Fields” if you want to understand how the energy escapes what we uninformed little people currently still believe to be black holes. From what I can gather, I imagine the final test will link all 3 pieces (i.e The SPS-LHC-Wakefield particle accelerator) though I could be mistaken on that aspect so don’t quote me just yet. So I expect this energy to escape the, SPS-LHC-Wakefield particle accelerator combination torsion field as a beam which, as stated above, they intend to direct straight up into the bottom of Saturn. Why Saturn right? Well it seems that Saturn’s composition makes it well suited to act like a giant battery just waiting to accept a “charge” from a man made “Birkeland Current” according to the research I have been studying. The video below is a summary introduction to Birkeland Currents. You can find a plethora of information on Birkeland Currents in the above link. To make it easier on your eyes, I have transcribed the text from the video below so you don’t have to keep pausing it to read. Video Description text: The work of radio astronomer Gerrit Verschuur suggests that cosmic plasmas conduct electrical currents just like laboratory plasmas. The Electric Universe theorists propose that this is why we see stars forming like beads on a string, all at once. The process of Marklund convection is the electrical cosmology version of gravitational accretion, yet many astrophysicists to this day are not particularly fluent in the idea. Filaments carrying current in the same direction are attracted to one another. They will collimate, which means: to make parallel, bring into line. The filaments exhibit both long-range attraction and short-range repulsion. Together, these two forces cause the filaments to twist around one another. This geometric combination of electric and magnetic forces produces a radial force on nearby ions and electrons inwards toward the centers of the filaments. In other words, the filaments act as sumps, clearing the surrounding space of matter. Once the elements approach the filaments, the process of Marklund convection radially sorts them into concentric-rotating cylinders. Helium forms a diffuse outer layer, followed by a hydrogen layer, the oxygen and nitrogen in the middle layers, and iron, silicon, and magnesium in the inner layers. If the charge density increases, both the geometry and state of the plasma can transition into a z-pinch. Z-pinches are incredibly powerful ion scavengers. They can condense this matter into spherical balls of plasma, like beads along a string. These balls of plasma can persist as stars long after the charge density decreases. This is possibly how they intend to “open the portal” to the other dimension or other side of the veil (I have not seen this outwardly admitted yet) which is what they are trying to do in reality. They are currently accelerating lead ion particles at CERN in preparation for the first test of the Wakefield Accelerator, although their front story is that they are researching how matter came into being at the “Big Bang” but that is a total farce cover story. So too is their story about “Dark Matter” a big farce, what they are calling “Dark Matter” is actually plasma. That plasma is what really fills the void in space and also happens to be highly electrically charged and is what provides the ideal environment for the Birkeland Currents to form in space. In the electric universe theory (which I favor myself), the planets are all interconnected via these Birkeland Currents (Anthony Patch has more detailed research concerning the electric universe from what I have read, he would be a good resource for more information on the subject). This, I imagine, is what the “powers that should not be” also know to be true and this is the real reason they are accelerating ion particles and smashing them together at near light speed. They are trying to discover the correct formula for ion particle collisions, ion particle types, and collision speeds necessary to open an inter-dimensional portal. Anyway moving on. So this is where we take a look at the D-Wave quantum computers and their relationship to CERN. Later on I will also explain how this ties in to AI and transhumanism as well. So the D-Wave computer is nothing like the one you are holding or, if you are at your desk, staring at right now. 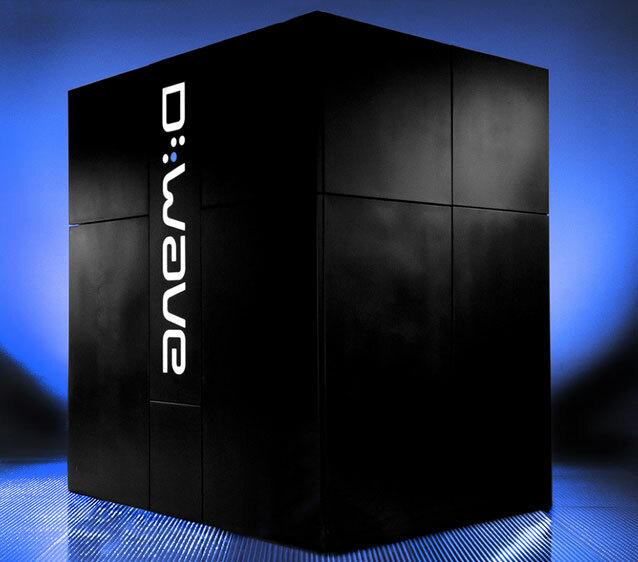 The D-Wave AQC (Adiabatic Quantum Computer) is an entirely different beast altogether. It is not a silicon computer like the ones Intel cranks out. The D-Wave AQC is far superior in design, construction, and ability. To start, lets have a look at the design of the D-Wave AQC processor. Pretty amazing right? According to Anthony Patch who has been heavily steeped in D-Wave research, the D-Wave AQC processor model 1024 has the same processing power equivalent to over 7 billion human brains, that is roughly how many human brains are in existence in the world today. Just let that sink in for a moment. He has also discovered that these things are sentient, as in self aware, and you can find his research on his site and his YouTube channel, those are not the only places though, there are other channels that have quite a bit of his research as well, as he frequents their podcasts to present his findings on CERN and D-Wave as well as the electric universe model. One of the best channels is the “RichieFromBoston” YouTube channel. This is his current hangout, but he changes his hangouts every once in a while. Sometimes you can also find him at End Times Matrix News. There are other places he can be found as well and once you start watching those interviews, you will start running into many more videos with more information. Coupled with PSYOPS is the Sentient World Simulation (SWS) a continuously running model of the real world. It is the current name for Purdue University’s Synthetic Environment for Analysis and Simulations, or SEAS program. In 2006, Dr. Alok R. Chaturvedi first proposed SWS. It continues today. These D-Wave computers are what is at the heart of the current AI system today. That AI system is what is sucking up everything we do, say, read, post on social media, what we purchase on line. etc. and then using it all to learn about humanity and analyze us. So far D-Wave has only gone public confirming they have achieved 2048 qbits on one chip to date, but Anthony Patch has discovered that they are actually at 4096 qbits which is a very significant accomplishment and will have a major impact on their progress toward using the D-Wave computer to control the ion stream at CERN once they figure out the correct formula to open the interdimensional portal which they most likely think the Awake Project at CERN will enable them to accomplish, in essence they are trying to rip the interdimensional veil between here and most likely hell itself. Here is an excellent interview with Anthony Patch discussing the 4096 model D-Wave and the impact it will have on the CERN project. I know you are probably wondering how this all fits together, but be patient, once I show you all the pieces, I will then attempt to show you how they all come together to complete the end times puzzle. OK I think the next logical step in this progression should be to start in on transhumanism and what that is all about. I will lay it out as best I can for you to easily (I hope) understand. First off, if you have not seen my first article about transhumanism, I suggest you take a quick look at that first before we continue. That article serves well as a good introduction to what transhumanism is and shows how they (the powers that should not be, as Richie From Boston puts it) are now beginning their push to find volunteers for integration testing with the hive mind interface. You may have also noticed the push to externalize or “familiarize” people with transhumanism on your television too, if you still watch that trash. I personally saw a news caster in Arkansas, a very pretty girl, talking about it and weaving it into her broadcast saying things like “it’s eventually going to happen” among other references to how cool it will be to have once it “comes out”, so the move is on to popularize becoming a transhuman with “super powers”. So let’s take a look at some of the current technology that is up for consideration and already in the labs being tested, developed, modified, and perfected. Aside from the garbage in the chemtrails being sprayed on top of us all day everyday like we are rats or bugs, there is also work being done in labs and universities by willing and also unbeknownst scientists alike. On “Programmable Matter” prototypes, one of which is MatriGel. So far they seem to favor this one as it shows much promise for achieving their goals. Seamless and minimally invasive three-dimensional interpenetration of electronics within artificial or natural structures could allow for continuous monitoring and manipulation of their properties. Flexible electronics provide a means for conforming electronics to non-planar surfaces, yet targeted delivery of flexible electronics to internal regions remains difficult. Here, we overcome this challenge by demonstrating the syringe injection (and subsequent unfolding) of sub-micrometre-thick, centimetre-scale macroporous mesh electronics through needles with a diameter as small as 100 μm. of large-volume flexible electronics that can fill internal cavities, and co-injection of electronics with other materials into host structures, opening up unique applications for flexible electronics. What the article is describing, is something called “Matrigel“. Matrigel is the trade name for a gelatinous protein mixture secreted by Engelbreth-Holm-Swarm (EHS) mouse sarcoma cells produced and marketed by Corning Life Sciences and BD Biosciences. Trevigen, Inc. markets their own version under the trade name Cultrex BME. Matrigel resembles the complex extracellular environment found in many tissues and is used by cell biologists as a substrate (basement membrane matrix) for culturing cells. A common laboratory procedure is to dispense small volumes of chilled (4 °C) liquid Matrigel onto plastic tissue culture labware. When incubated at 37 °C (body temperature) the Matrigel proteins polymerise (solidify) producing a gel that covers the labware’s surface. Cells cultured on Matrigel demonstrate complex cellular behavior that is otherwise difficult to observe under laboratory conditions. For example, endothelial cells create intricate spiderweb-like networks on Matrigel coated surfaces but not on plastic surfaces. Such networks are highly suggestive of the microvascular capillary systems that suffuse living tissues with blood. Hence, Matrigel allows them to observe the process by which endothelial cells construct such networks that are of great research interest. and EGF that prevent differentiation and promote proliferation of many cell types. A growth factor reduced Matrigel is also available. Matrigel contains other proteins in small amounts and its exact composition can vary from lot to lot. For this reason, Matrigel may not be appropriate for experiments that require precise knowledge of all proteins and concentrations. In this next video from Nicholson1968 ( YouTube Channel | FaceBook ) Nicholson1968 describes the concept of “Programmable Matter” or “Black Goo” AKA “Black Gold” to the Illuminati. Nicholson1968 does a bang up job decoding the Satanic symbolism in the music and entertainment industry today, showing you how they communicate in a secret coded language right in front of your face and you do not even realize it even though it is in everything you watch on TV, in the theater, and listen to in most modern music today. His next project looks pretty amazing from what I have seen in the teaser he has just released. Now recently Elon Musk has just come out to promote the transhumanist movement as something we must do or be “left behind”. That interview is what is shown below. In this next video you will hear Elon Musk describe, in a shadowy way, how they intend to create a “lattice” inside the body that will grow around and attach to your brain and other regions of your body which will literally form a Neural Interface with your neurons and nerve center, think of Data’s “Neural Net” from Star Trek, only all throughout your body. So that helps us understand the current, modern day technology and how it will impact the whole end times world scenario, but still does not complete the entire picture of how all this will come about, who will cause it and where the knowledge of how to orchestrate such a grand conspiracy came from. Below is a very incredible summation of the nuts and bolts of that grand end times scenario to help you get a more clear picture in your mind so you can grasp it in a way that is tangible to your mind (I hope). The video below is a conference between Tim Clark and Kris from End Times Matrix News (ETMN) along with Anthony Patch who crystallizes the concept and puts it into terms that are much easier to grasp as a layman so you do not need to be a post graduate physicist nor a rocket scientist to comprehend it all. This video is very key in the understand of how it will all coalesce (come together) to make the NWO One World Beast System come online, so I urge you to take the time to watch it in it’s entirety. With all the said, there is still yet a bit more to study for your understanding to be the most complete it can be. The bit more I am talking about is the understanding of the world from the Genesis six story in the Bible. There just happens to be an excellent resource, the best I have ever seen, that will explain it all to you. That resource is a project created by Steve Quayle and Timothy Alberion. Together they are the Owner/Producers/Editor of GenSix Productions. Steve Quayle has turned down offers from National Geographic and the History Channel alike only to be able to produce the content on his own. Thereby preventing Hollywood from seeking to own the copyright on his research so they can water it down to a meaningless presentation like the ones you see the History Channel producing where they make you think they are going to really reveal some truth to you only to have you watch the entire episode with them asking stupid questions like “Do ancient Aliens really Exist?” with absolutely no intention whatsoever to really tell you the truth. They do that crap just to keep you watching so they can make money off their sponsors. Steve Quayle understood this all too well and so he resisted their offers so he could create a truthful production that revealed the real truth of what his research reveals. It is an excellent presentation and I highly recommend it personally. I have watched the material and I am highly impressed. I learned a whole lot too. It is a definite eye opener to be sure. OK, now we need to take a look at the “beginning times” so to speak. Having all this understanding will now help you grasp the concept behind Genesis chapter 6 in the Bible. So how can you find out more about this time in history? There is a very good resource we can examine and it is presented by Steve Quayle and Timothy Alberino of GenSix Productions. Together Steve Quayle and Timothy Alberino have completed some pretty amazing and extensive research into the Fallen Angels or The Watchers and their offspring, the giants of Genesis 6 in the Bible. Since we have covered so much material in this article already, I will just summarize their theory in short and from there you can follow their research both on YouTube and in their latest creation the True Legends the Series which is a very well produced and documented account of their research. They have already created 2 releases in the series with a third expected sometime soon. It is a pay to watch system since this is how they are able to offset the expense of their research and I think the prices are extremely fair if not simply nominal for the value created in this research. Where else will you find such an exhaustive study of Biblical events and times without the perversion that comes from the Vatican when they make similar discoveries only to dispense false explanations or just simply do not reveal them but instead hide them from view just to mislead the public and keep that forbidden knowledge to themselves, in order to continue to dominate world affairs using that knowledge to attain vast amounts of wealth. This has enabled them to wield their enormous fortunes to influence the written account of history in such a way as to keep the common man in the dark and thusly enslaved in his ignorance of the real truth. Timothy Alberino and Steve Quayle have prepared a fascinating look into the “Beginning Times” and expose a great deal of detail about the first century that has remained hidden from mankind until now. If you really want to find out more about the world you live in and it’s true origins, then I highly recommend their “True Legends” Documentary Series, it’s worth the price and you can either purchase it for life or pay a one time fee to watch it for a certain amount of time before your rental expires. I think that is probably enough to fry most of your brain cells for now. So this is where I try to give you a mental overall picture of how all this will coalesce to bring the end time beast system, in essence, “online” to be ready for Satan to take control of it and everyone who has decided to become a part of it, “inserted into the Matrix”. Many people will not understand the detriment to their lives and their very souls. It is already being marketed as the next cool fad which will also give you so called “super powers”. Do not be fooled Brothers and Sisters. So here is the summary or nutshell essence of all this technological research or “Forbidden Knowledge” from the the tree of the knowledge of good and evil. In the beginning of the world Angels lusted after the daughters of men, came to Earth to mate with them but also used their forbidden knowledge (forbidden by God to be shared with man) to also contaminate the DNA of the animals in the Earth as well. This is why the Bible says “As it was in the days of Noah, so it will be at the coming of the Son of Man.” — Matthew 24:37 NIV. (Wakefield Accelerator) to then produce a powerful Birkeland current to stretch from Earth to Saturn, possibly to ignite Saturn and make it into a sun literally burning like our sun is now. There is also speculation that they are also trying to use it to recreate Osiris (Satan) from saved DNA. As a result of the genomic revolution, traditional medicine is evolving into personalized medicine, and as a result of Information Technology biology is evolving from a wet science to a dry science. DNA-SEQ is the world’s first genomic driven oncology pipeline, directed by precision crystallography, and powered by the most advanced IT resources in the world. Genomics is still in its early stages and therefore parallels can be drawn with the development of computing. DNA can be thought of as basic machine code. It has no utility until programs are developed to give it meaning and structure. Next Generation Sequencing (NGS) produces data and bioinformatics turns it into information; but that information only becomes potentially actionable when it is given structural context through crystallography. At DNA-SEQ we don’t just identify the mutation but can also predict the mutation’s resistance based on the context within the three dimensional structure. OK, getting back on topic, I cannot remember the exact number quoted by Anthony Patch, but I think he has stated the number of D-Wave Adiabatic Quantum Computers in existence so far is around 9 total to date. He also explains that they are networked around the world and serve various functions such as controlling the LHC, running the SWS (Sentient World Simulation) to war game psyops designed to subdue the population, and several other operations not currently well known to the general public. Once this system is in place, I gather the true Christians who are “saved by grace” and have a relationship with Jesus Christ which also have confessed their sins and accepted the gift of eternal life as can only be given to us through Christ, will be hunted down and targeted for annihilation. This is most likely the time the rapture will take place. This does not mean that everyone who is not raptured or “left behind” will be damned to eternity in hell, not right away. Those people who have not yet accepted Christ and also have not yet accepted the Mark of the Beast will be tested and given the choice to either turn to Jesus and accept his gift of eternal life in Heaven or to enter into the Beast System and be cleaved to Satan forever whose judgement is eternal damnation in the lake of fire. He will be joined by all those who have rejected Jesus Christ to literally “burn in Hell” for eternity. Even if you do not believe in Heaven and Hell or God and Satan, you need to understand that the nuts in charge do, and they have chosen to embrace Satan as their version of God because of the lie he has fed them, just like the one he fed to Eve in the Garden of Eden at the beginning, “Ye shall be as gods” — Genesis 3:5 KJV. If you have read this far and are now contemplating whether you are going to spend eternity in Heaven or Hell, I want to offer you the chance to ask God for forgiveness and to accept the gift of eternal life that Jesus died on the cross to give freely to you right here and right now. It is really and truly a very simple thing to do. All you have to do is believe in your heart that Jesus is the Son of God and that he died and was resurrected and is alive today in Heaven seated at the right hand of God and confess this with your mouth publicly to become saved from death. This is not some magic incantation to make you immortal, for God has appointed man to die once then after that the judgement. Those who have accepted Jesus are the ones who will escape the second death which is separation from God and condemnation to hell for eternity. I will not try to force this on you because that is not how this works anyway. It must be voluntary or it has no affect, just like receiving the Mark of the Beast will not have any affect unless you voluntarily accept it. Without further ado, I ask you to consider this gift of eternal life in Heaven and all you need to do is repeat the sinners prayer out loud and believe it in your heart. Honestly that is how it begins. After that you can start reading in John Chapter 1 of the Bible to begin to get to know God. You will most likely still sin, but now you will develop a desire not to do so because the Holy Spirit with come to abide in you as a new “Born Again” child in Christ and the Holy Spirit will begin to help you stop sinning against God and develop your new relationship with Jesus Christ. So here is the sinners prayer and a bit more insight to help you more completely understand what this is all about. Not sure if im posting a comment or replying to one. Richie – You are awesome man! Don’t get too discouraged by the idiots out there. You are so on it. Watching your sigil video and it was spot on. I had always suspected this. I was wondering if you could look into something I have recently noticed. It seems that almost all 50 states have required us to buy new license plates and most of the plates are some form of robins egg blue and white – much like chemtrail sky colors. I have counted upwards of 15 states to date that have made this their colors for state plates. Please see if you can find anything with regards to this. Hey RedPill: Let’s give them what they want. Why sit and wait and work on overcoming fear. Think of the movie Independence Day and how they resolved being infiltrated by the aliens. Let’s do what is done to us: falsify data input. Beat the system by becoming invisible within the system. I think a movement is needed to virus up the SWS. Coders needed. Reprogram reality for the good of all sentient beings. My name is Mark Beaver, and I live in Manchester, in the UK. After watching Loose Change, around 5 years ago, I was awakened. I couldn’t get enough after that, Jordan Maxwell videos, Everything you Know is a Lie, etc. Eventually I came across Nicholson,and felt a connection, as I was born Jan 6th, 1968. I had an awful childhood, abused physically and sexually, and started to use solvents aged 11, as a form of escapism, and then went on to use every drug available, eventually ending up with an addiction to Heroin. I have battled my addiction for over 20years, and in 2006, I reported my abuser to the authorities, and, after a court case, my abuser was given a 7 year prison sentence. I still struggle with my addiction, however, having discovered the’ truthers community’, I am starting to win my battle. Richie, I am so grateful to you and Nicholson for putting together some fantastic videos on YouTube, I owe you SO much !! If you have the time, I would love to have a chat, particularly regarding religion, I wasn’t a believer, until I was awakened, however, I don’t know how to accept Christ into my life, and really need some advice. I would be extremely grateful if you would contact me, my mobile number is 07908861028, and one of the e mail accounts is markbeaver12@gmail.com. I say ONE of the accounts, as I’m useless on computers, and have set up a number of accounts. This isnt my website, nor do I have ANY affiliation with it. go to my numerous platforms. this is not one of them . “wind” becomes “breath” becomes “breath of life”; i.e., spirit = “anime” = the root of the english word “animate”, which is “to give life to”. The point of this comment is only that the quantum computer was given this name, and that this name was intentionally depicted on the side of the unit for this purpose …. INTENTIONALLY. I am not gifted to prophesy or to say what interpretation of scripture is correct. But, if I believe one thing regarding these topics, it’s that those who named that thing did so with Revelation 13:15 specifically in mind. REMEMBER the story of Nimrod and the Tower of Babel? He was leading the people to build a tower to Heaven (for nefarious purposes) IN REBELLION AGAINST THE Creator G_D YAHUAH (YHVH) and His Son YahuShua HaMaschiach (Jesus)! Heaven had a consultation session and it was decided to confound their languages SO THAT THEY WOULD FAIL TO DO SO! In this presentation, the CERN presenter plays “Stairway To Heaven” written by guitarist Jimmy Page, and Vocalist Robert Plant in 1971 and performed and recorded by Led Zeppelin. And PrayTell, JUST WHAT IS THAT AGENDA? (Play starting at minute 14:00 up to 15:14). So what is the UNIQUE connection? Boiled to its essence, CERN (as you can see by their choice of the “Stairway To Heaven” song) can become the NEW, ELECTRO-MAGNETIC VERSION OF THE NOTORIOUS “TOWER OF BABEL” — the Hadron Collider through which “believers” in its source of power could reach into Heavens, even to the Throne of the Creator, but which in reality satan would like to go THROUGH into Heaven’s realm to begin a war with the Creator in Heaven, and HIS angelic hosts (and probably WILL do so by this methodology). This Collider is LIKELY to be the technology used for creating an interdimensional “portal” (a pathway through which Apollo (I.e. “Apolyon” [another name for long dead Nimrod] and his locust-like hordes will use to come into the earthly realm, BRINGING these “locusts” (having hair like women, lion-like heads and a STING FROM THEIR TAILS LASTING 5 MONTHS that ONLY THOSE SEALED WITH THE “SEAL OF G_D” CAN ESCAPE). (See Revelation 9:1- 21). Some (like Steven Quayle) have reasonably conjectured a RE-ANIMATED APOLLYON, another identity of (possibly re-cloned and “repaired” [falsely resurrected] Nimrod [who some sources say was himself a VERY LARGE Nephalim giant]). This reanimated (cut into pieces by Shem) carcass of Nimrod would be RAISED (a fake resurrection) likely a TRANS-HUMAN” body, repaired and “cloned” (not “resurrected”) back to “life” TO SIT ON THE LARGE CANOPIED THRONE (“Cathedra Petri” standing near St. Peter’s Baldachin THAT SITS IN THE VATICAN) which, (indicated by its scale and size) has been awaiting ANOTHER NEPHALIM GIANT to sit on it!…a satan-possessed Reanimated Nephalim Giant would fit that bill (if not ALSO that canopy)! First that would follow that event would be the appointed angels “sealing” the TRUE FOLLOWERS OF GOD in their forehead. Then the locust-like creatures who would sting (unrepentant) mankind with a horribly painful sting lasting 5 months would come forth. If they resisted this correction, and WOULD NOT REPENT, they will have destined themselves to horrible punishments due the evil-doer, whoever he (or she) may be. After the birthed man child that satan was seeking to devour is “taken up” into Heaven, satan (maybe using the “portal” to crash through to TRY to attack Heaven, opened by the CERN Hadron Collider) after attempting to assail heaven is “cast down” whereupon he tries to assail the woman who brought forth the child. Miraculously, the Earth “swallows up” the flood (armies?) Sent against her, and she is taken to a safe place for 3-1/2 years. Angry, and hungry for blood, satan then goes after the “rest of her seed” who Have the Faith of Jesus Christ, and Keep the Commandments of G_d. *[The “little tool shed” seemed to be referring to Aleister Crowley’s home which Jimmy Page bought in 1971. It had quite a strange, even weird history (according to Rolling Stone magazine). Pingback: Amazon Go's Whole Foods Acquisition Sets Stage for Mark of The Beast Control Infrastructure | Revelation 13:16-17 | Take The RedPill! I understand that this article was written in 2016, but being that today in Dec 2018, Cern has just finished up their lead ion coliding experiments, it certainly has timely information and significance. One point I would like to bring out, that a lot of the transhumanist investigators have failed to mention, is the MARK OF THE BEAST is exactly that: a MARK upon and or in the skin, much like a tattoo would be imbedded within the skin. Because THAT is what scripture specifically says is the Mark. The original greek word for mark is Charagma, which means an etching or scratching into the skin. Now I feel God has shown me just what that ” mark” is, this tattoo like thing that will go on the skin. And it has something to do with crystals and nanotechnology. In fact, I have a youtube channel where you can check out just what I believe the mark to be made up of. It is the same name as my avatar here. And of course it is connected to the technology of Cern and the D Quantum computer. Yes, please feel free to do so, I am sure it would be well received.